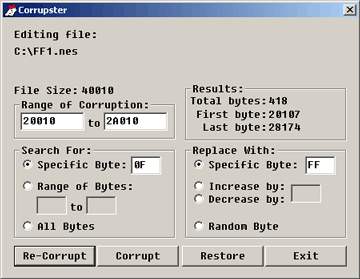 Corrupster is a simple file corrupting utility I made for my own personal use when finding offsets for FFHackster. It can search out specific bytes and replace with a fixed value, or add/subtract a value, or even replace with a random value. However, there are many better corrupters around, so this is really just here for a novelty ^^.